The colors of your decorative concrete curbing are based on the samples that we bring to you for viewing and choosing. There are a wide variety of color choices of landscape curbing that will reflect and enhance the quality of your property. Each color is unique and chosen by you. Color is not applied to the surface of the curbing, but actually included in the mixing process, meaning it will not wear away. The surface of the concrete curbs can come in many shapes and styles. Stamping concrete curbs provides a unique appearance to each curbing project. Stamping is performed by either a roller or with a metal stamper.Once the curbing is laid and stamped, it is then "sealed" to prevent weathering. There are a number of options and choices for mould selection. We offer a variety of landscaping curbing for the property owner to choose from that will best fit the function. 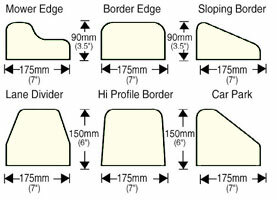 Each curbing profile has its own uniqueness and appeal and should be chosen correctly through consultation with the property owner and IslandGreen Landscaping representatives.